The day after Thanksgiving we decided to get to Magic Kingdom in time for Rope Drop. Apparently the rest of the world decided this was the thing to do as well! The masses streaming into the park from the busses, ferry, and Monorail were a bit daunting, but that's just because they were all trying to get in the gates. A good thing to remember when you see crowds like this is that once in the park, everyone has a different place they want to go first. Focus on this over your panic. I posted the photo above to Twitter while laughing over the crowds. Rope Drop is one of my favorite Disney things. It never ceases to make me tear up when the various characters and Main Street USA citizens pour off of the Walt Disney World Railroad and start waving and singing! This trip I put down the camera and just enjoyed the pixie dust as I watched the show. 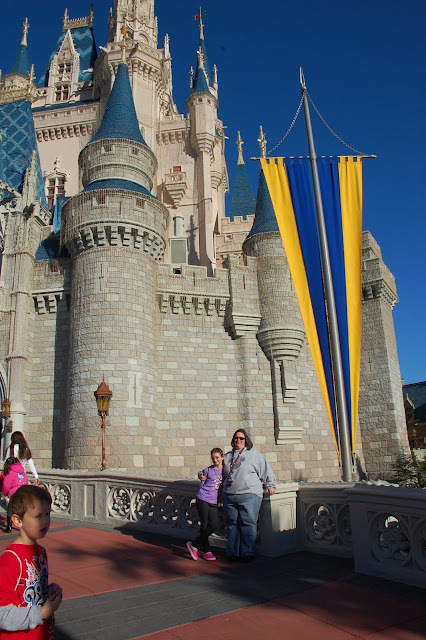 If you are looking for that one magical moment to make your next trip special, making it to Magic Kingdom Rope Drop is a must! It starts 10 minutes before park opening. If there are morning Extra Magic Hours, it starts before that time. Be sure to be at the bus stop about an hour before park opening to be sure to make it there on time. My family and I usually have one morning where we get to Magic Kingdom right at park opening and can complete most of Fantasyland (popular attractions and all) by lunchtime or soon after. This is the first time we included New Fantasyland, and it worked fabulously. Read through this week's posts to see how we did it! I'll sum up the FastPasses and order of attractions in Friday's post. with small crowds in the early mornings. Hugs for all! Katelyn joins the fray! 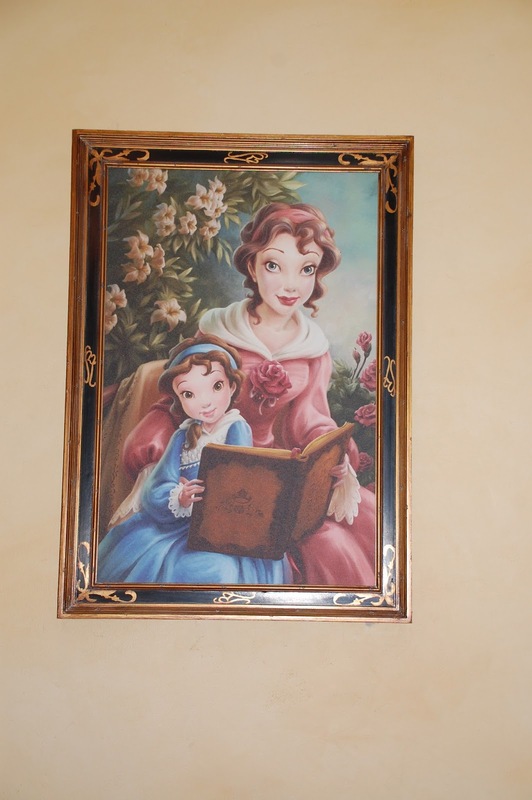 Once together again, we went straight to Enchanted Tales with Belle. Like always I've included a large number of photos with this post, and since it's a new attraction, it gets its own post! The queue was already getting a little long, but we got in it when the wait time was about 20 minutes. Guests in the queue wind their way through Belle & Maurice's garden and into their cottage. Beast's Castle looms above as guests delight in the fact that Disney Imagineering spared no detail in the queue. I remember the weather vane from the movie! Even the water fountain looks like something Maurice dreamed up! in the Be Our Guest restaurant. Inside the cottage there are plenty more details to check out while waiting to enter. I won't spoil the surprise of how the room enchants to take guests into Beast's Castle because it made me gasp with pure joy when it happened. I recommend not spoiling it for yourself ahead of time! Katelyn is about the same height that Belle was at age 14. Tall kiddos! Josh is about 3 years taller than Belle! Watch here! Something magical happens! 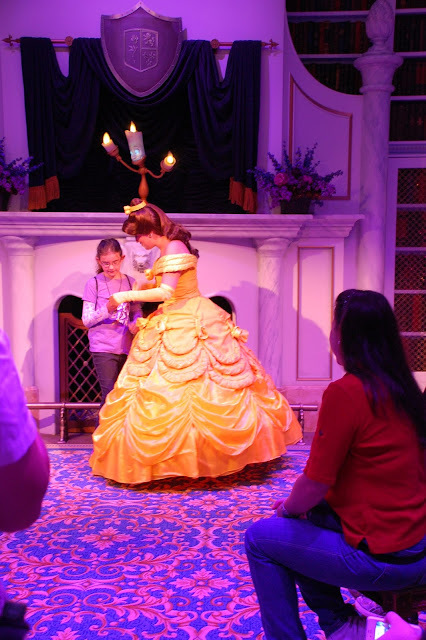 Guests enter a chamber outside of the library where a cast member hands out props and roles to children who would like to participate and some adults. There are plenty of roles to go around! 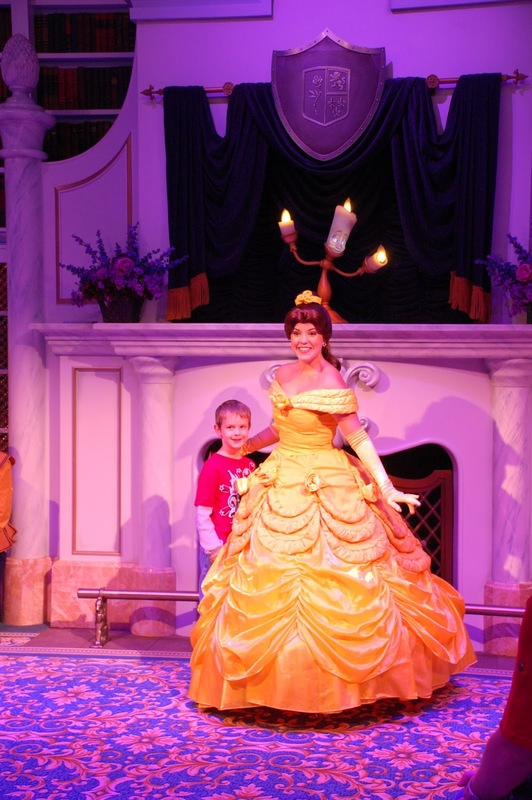 Then everyone is lead to the ballroom where Belle and Lumiere await. 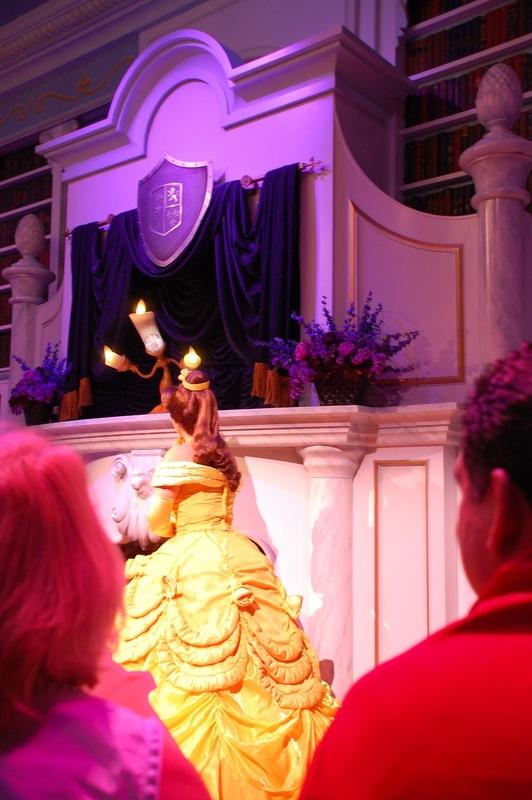 The animatronic Lumiere serves as the narrator with Belle acting out the story with the new cast of characters. His movements and speech are even better than what you'd expect! Once again Disney Imagineering has outdone themselves! The entire time a PhotoPass Photographer is taking photos of the show. Just outside the library - yes she speaks and moves! Belle and Lumiere chat together. At the end of the story the cast of characters are greeted individually by Belle and Lumiere, who pauses perfectly for each snap of the camera, for photos. On the way out of the library families are given PhotoPass cards with all of the photos from the experience. While you end up with everyone's photos, those can be deleted later. Joshua and Belle with Lumiere posing the in the background. 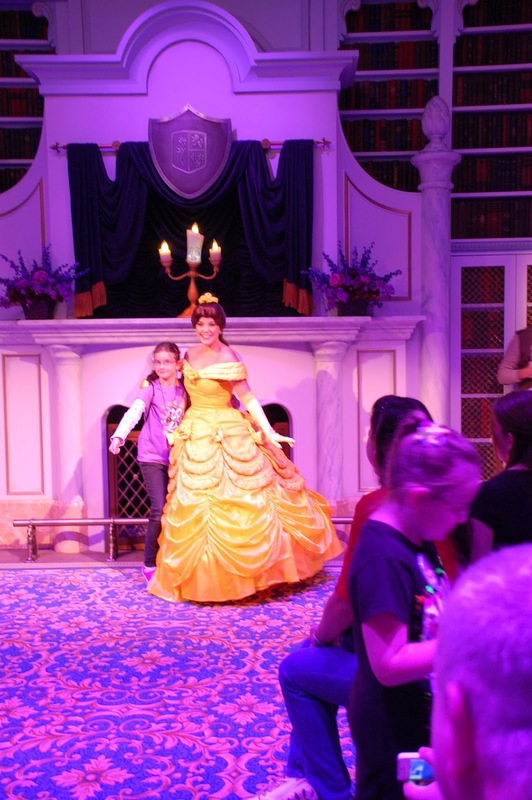 Katelyn practicing her princess pose with Belle. She did that on her own! Perfect! Notice that Lumiere's pose has changed. Katelyn showing her necklace to Belle. Overall this was a magical experience, enchanted one might even say, that I'm glad I didn't miss. I was tempted to say, "oh that's just story time for little kids," but it's so much cooler than that! I probably wouldn't go see it again without kids, but it's a definite "do at least once" experience. Come back Wednesday to journey under the sea with Ariel in her new attraction in New Fantasyland. Great post! Enchanted Tales with Belle was one of the highlights of our trip and we almost didn't do it. It is definitely made for all ages and not to be missed. So sorry I missed this earlier this year! What a magical experience for sure. Love the storytelling and bringing in the guests to help, such a great idea. It's like what education is realizing and working on now: it's all about engagement! Engage your audience by interacting with them and letting them participate, and they buy in to the experience and get more out of it. :) Disney is one smart cookie! You are braver than me to go the day after Thanksgiving! I'm hoping to see Belle during my next trip. I so agree Joanna- another attraction where the queue helps tell the story and set the stage. This is not to be missed! I adore what Disney is doing with its queues lately! Making them interactive and fully immersive makes standing in line not so bad.